MITO, IBARAKI PREF. 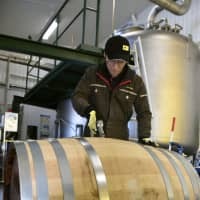 - A sweet aroma wafted through the air as unblended malt whisky gushed from a storage cask at Hokkaido’s Akkeshi Distillery in the freezing rural north of Japan in December. The distillery, located in the village of Akkeshi in eastern Hokkaido, is just one of a growing number of craft operations that have sprung up around the nation, their products drawing parallels with more established giants such as Suntory and Nikka, which have become renowned for the unique profiles of their whisky. Akkeshi, which opened in 2016, utilizes large puncheon barrels made of Mongolian oak, native to Japan, to hold the whisky as it ages. Its whisky is distinctive for its citrus notes and the briny aroma the company says is derived from the fog that rolls through the area. Wetlands surround Akkeshi Distillery, similar to the cool and damp conditions of the Scotch whisky hotspot of Islay, one of the southernmost of the Inner Hebrides Islands located off the west coast of Scotland. It is the main reason Akkeshi’s operator, the Tokyo-based Kenten Co., chose the marshy seaside setting with its rich peat deposits. The company wanted to produce liquor with the same smoky profile of Islay whisky, considered a central character in Islay malts derived from their production in close proximity to peat marshes. 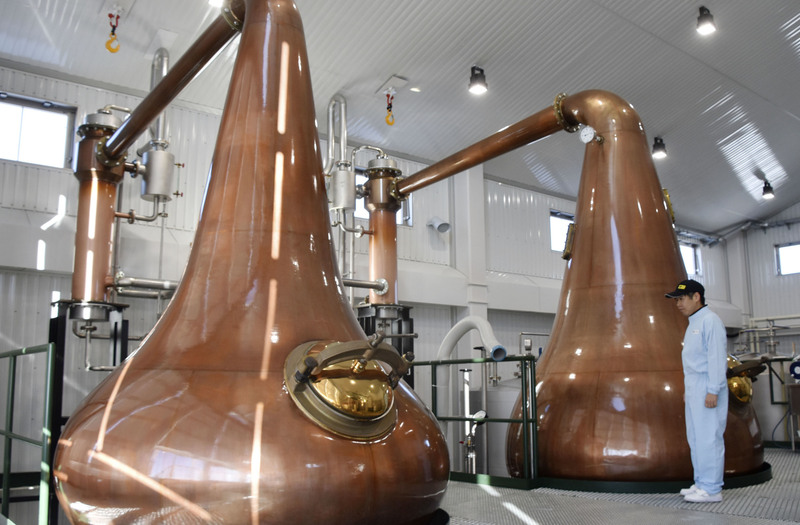 The distillery, which brought in equipment from supplier Forsyths in Scotland, already has about 1,200 casks to age their product. That includes bourbon and sherry casks but also those made of Japanese oak. Two pot stills and a mash tun, in which malt is mashed, were also imported from Forsyths. Like Islay whisky, the company uses water that passes through a peat layer, it says. In February 2018, Kenten introduced its first product, Foundations 1, a vatted blend of nonpeated malts matured for five to 14 months in bourbon casks. Its first peated product, Foundations 2, a vatted blend of peated malts matured for eight to 17 months, became available last August. Kiuchi Brewery, located in Naka, Ibaraki Prefecture — known for its sake, shōchū and craft beer — jumped on the whisky bandwagon in 2016. 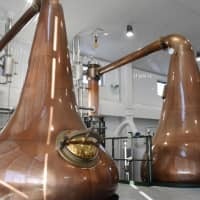 Around June, the company plans to begin operating a new whisky distillery in Ishioka, Ibaraki Prefecture, capable of producing about 120,000 liters of whisky per year — an approximately twelvefold increase on the current amount of spirits the company makes. Around 40 percent of the barley used as raw ingredients for its whisky — some 80 tons — will be procured from within the city’s boundaries, and the company plans to offer distillery tours. “We are very particular about using local raw ingredients. We want many tourists to visit our distillery,” said company Vice President Toshiyuki Kiuchi, 55. Since 2016, several craft distilleries have come online, including Kinryu Co.’s Yuza Distillery in Yamagata Prefecture; Nagahama Roman Beer’s distillery in Nagahama, Shiga Prefecture; and Hombo Shuzo Co.’s Mars Tsunuki Distillery in Minamisatsuma, Kagoshima Prefecture. Shipments of Japanese whisky, which went into a tailspin in the early 2000s, began a turnaround in 2008 with the renewed popularity of Japanese-style highballs, a beverage quite distinct from typical whisky and soda mixes because of the attention paid to quality. Whisky even gained a foothold in popular culture when the TV series “Massan,” a fictionalized account of the lives of Masataka Taketsuru and his Scottish wife, Jessie Cowan, aired on NHK from September 2014 until March 2015. The program depicted Taketsuru’s struggles to start Nikka Whisky Distilling Co. According to the Japan Spirits and Liqueurs Makers Association, about 137,000 kiloliters of whisky was shipped domestically in 2017, double the amount 10 years earlier. Whisky exports were worth about ¥13.64 billion ($125 million) in 2017, more than an elevenfold increase over a decade, according to the National Tax Agency. Indeed, the Japanese whisky boom was so meteoric that leading producer Suntory Holdings Ltd. announced last year that it would discontinue selling two premium brands due to shortages fueled by global demand for the award-winning products. Japan’s wide variety of climates help it produce smooth and elaborate whisky brands that are drawing interest from overseas drinkers. Craft distilleries are winning international awards normally reserved for well-established brands. Ichiro’s Malt, a single malt produced by a tiny distillery in the Saitama city of Chichibu, has won global accolades and a slew of awards, making a name for itself as one of Japan’s premium craft whiskies. 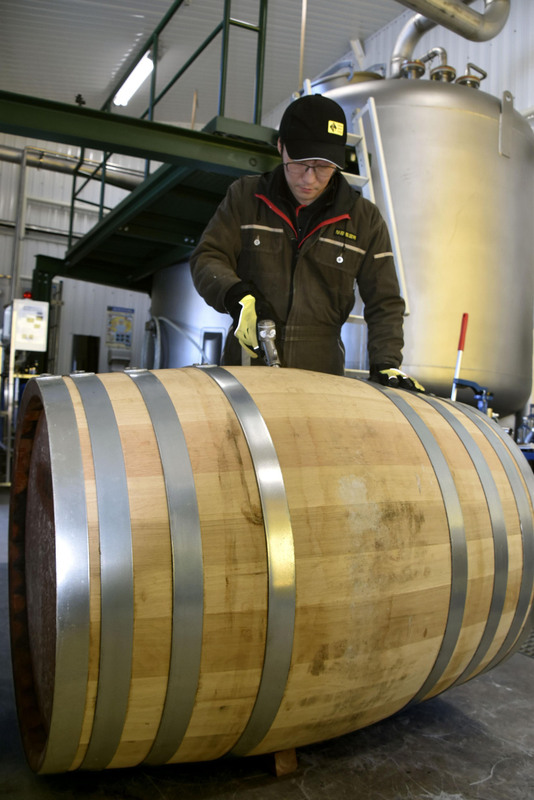 Experts say the long maturation periods and large investment required to produce whisky, compared with other alcoholic beverages, makes the success even more significant.